Are mobile hotels the way to go? This large truck has been converted into a two story hotel that can accommodate a modest amount of guests for a very memorable vacation. 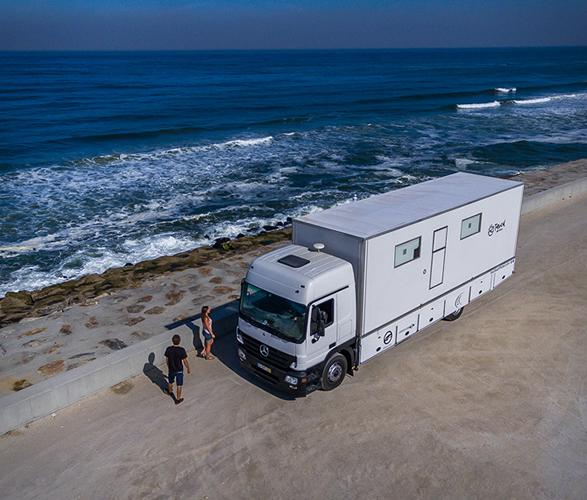 For those looking for some quality beach time and want to experience different surf spots everyday but do not want the hassle of figuring out transportation, this truck hotel might be the answer to your dreams. 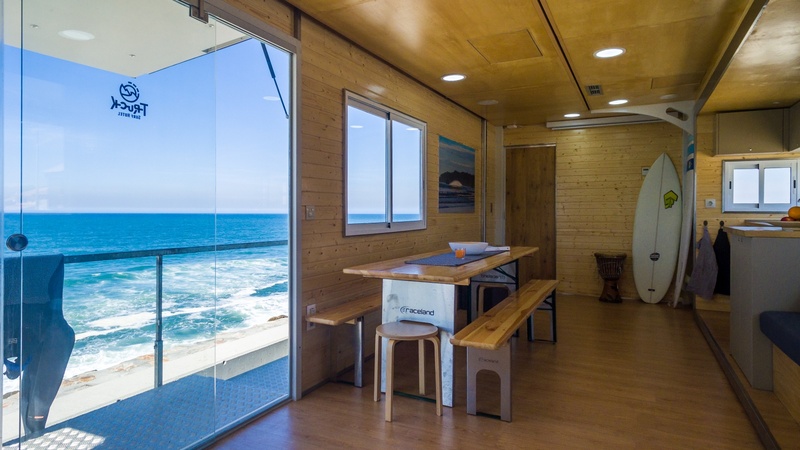 The Truck Surf Hotel is a luxury mobile hotel that can take you right on the beach. For those beginning or in the process of making summer plans, this hotel may be the answer to an adventure packed vacation. Especially for those who dream about a beach filled vacation, this hotel truck hybrid takes you on a getaway that showcases the wonders of nature and explores different cultures. 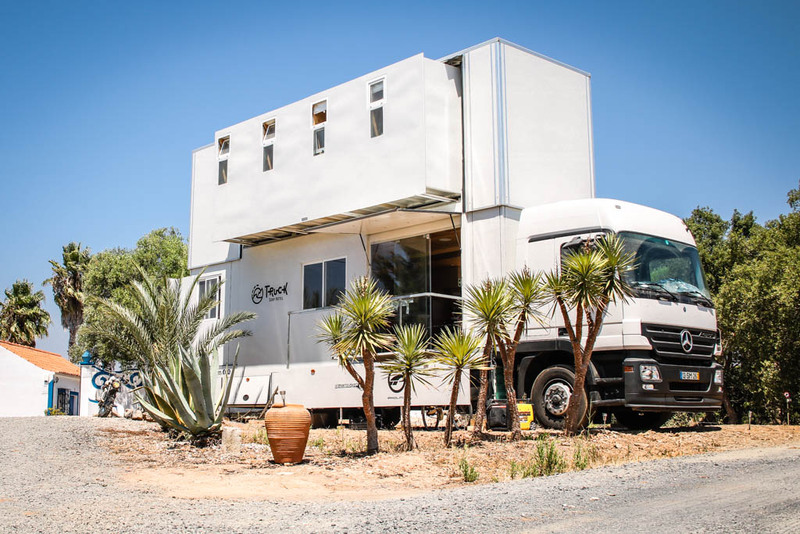 The truck hotel current offers adventure trips in Portugal and Morocco. They offer a large buffet-style breakfast, breathtaking views of the beach and tons of time to catch some waves. The vehicle itself is a converted Mercedes Actros that has a hydraulic system that can expand into a two story living space. The first level has a sprawling living room with a comfortable couch, nook area, a full bathroom with a shower and a kitchen. large side doors open out to a generous sized terrace that have bean bag chairs to enjoy the view of the surf. The second level is dedicated to the sleeping quarters and there are a total of five rooms, four are equipped with bunk beds. This awesome hotel is great for those looking to soak in nature, enjoy some waves and excited to immerse themselves in a new culture. This hotel on wheels allow the flexibility to travel, offer the most breathtaking views and most importantly allow you to take your accommodations with you! What more could you ask when exploring a new place than to walk a couple of feet from the place you just explored to go to your hotel. Curious to see this truck surf hotel for yourself?